When Gerald Ford took over the presidency after Richard Nixon’s resignation, Ford said his main objective was to heal the nation’s wounds. His dog Liberty ended up stealing many of our hearts. 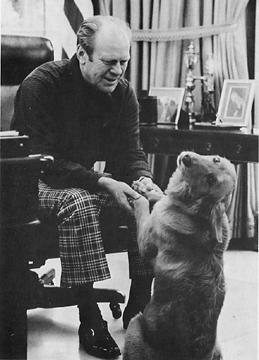 Ford and his wife, Betty, were partial to golden retrievers, and one of their retrievers had died not long before they moved into the White House. Their daughter, Susan, enlisted the help of Ford family friend and White House photographer David Hume Kennerly in getting them a new dog. Kennerly contacted a reputable breeder in Minneapolis about an 8-month-old puppy. The breeder, however, wanted to make sure the puppy was going to a good home and asked several questions about the prospective owner. Because Kennerly did not want to reveal he was getting the dog for the president of the United States, he tried to skirt the questions by saying the puppy would live with a middle-aged couple who had four kids and had owned golden retrievers before. The breeder refused to part with the dog without more information. Good for him! The questions kept coming, and when the breeder asked if the father had a steady job so buying enough food for a big dog wouldn’t be an issue, Kennerly decided to let the cat out of the bag, so to speak. The breeder was no doubt ecstatic that his prized dog would be going to President Ford. 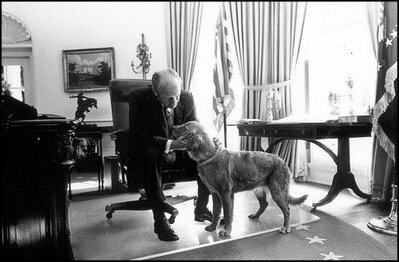 President Gerald Ford gives his golden retriever, Liberty, some attention in the Oval Office. Susan Ford surprised her father when she let the pup, whose name she changed from Streaker to Liberty, into the Oval Office for their first meeting. In his memoir, Ford recalled how he got down on all fours to play with the puppy. The pair hit it off right away, and it was Ford himself who often took Liberty for her walks. One notable incident occurred when Liberty awakened the president early one morning indicating that she needed to go out. Dressed in his bathrobe and slippers, Ford took the dog down on the elevator and outside. For the return trip, however, the elevator would not work. Because the stairway doors were locked as a security precaution, Ford — accompanied by the golden retriever’s barking — had to pound on the walls until Secret Service agents came running to help. 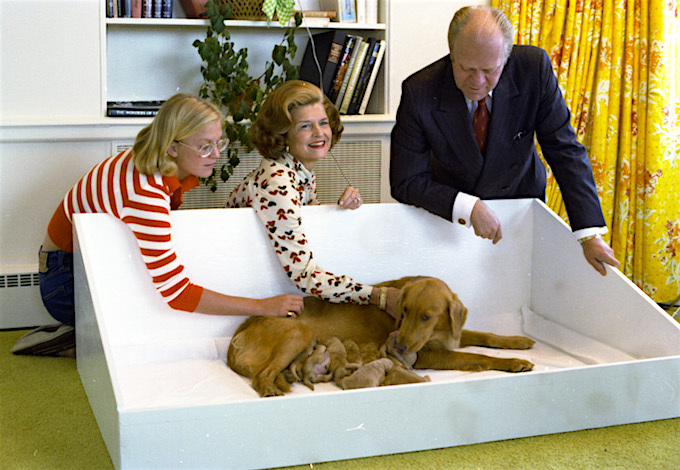 Susan, Mrs. Ford, and President Ford with Liberty and puppies, Sept. 16, 1975. Liberty became a national celebrity when the Fords decided to breed her with a champion golden retriever from a breeder in Medford, Oregon. The press went wild when Liberty gave birth to nine puppies — four females and five males — at the White House. Watchful and protective of the puppies, Mrs. Ford did not let them be photographed until they were 2 months old — and then only by Kennerly. By then, the photographs were very much in demand, and White House staff made a rubber stamp of Liberty’s paw print to “sign” all the requests. Liberty’s puppies themselves were also in high demand. The Fords kept the one blonde pup, naming her Misty. A pup named Jerry went to the Leader Dog School for the Blind; four went as gifts to friends; and the remaining three were purchased for $300 each by other friends to help defray the cost of Liberty’s breeding. After the Fords left the White House, they featured Liberty and Misty on their 1977 Christmas card, with each of the dogs surrounded by her new litter of puppies. Liberty died in 1986 at age 11. 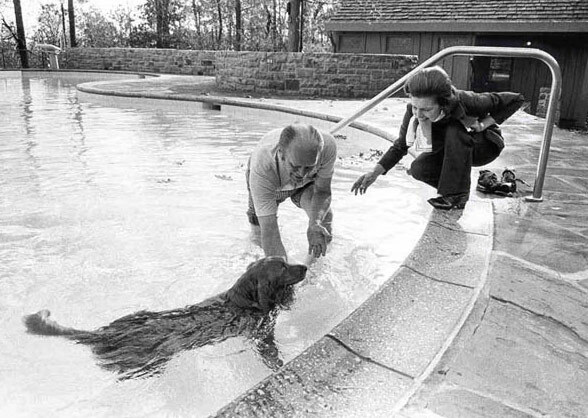 President and Mrs. Ford with their dog Liberty at the Camp David swimming pool. October 26, 1974. Photo: Courtesy of Gerald R. Ford Library and Museum.